http://www.simplyrecipes.com/recipes/yorkshire_pudding/ The 11th Doctor claimed to have invented this British staple, usually an accompaniment for Sunday roast. When Rory challenged him, he quipped, “Pudding but savory. 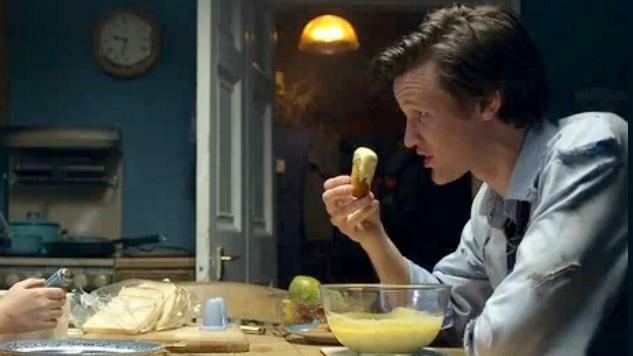 Sound familiar?” Seeing as the first thing that the 11th Doctor could stomach was the savory pudding combo of fish fingers and custard, we’re wont to believe him. https://lovinghomemade.com/2013/02/22/party-cupcakes-spy-cupcakes-with-hidden-secret-agent-jelly-babies/ Tom Baker’s Doctor often carried Jelly Babies in his pockets and offered them to friends (or enemies) to break the ice. These “spy” cupcakes have secret agent Jelly Babies hidden inside; top them with “psychic paper” with whatever message you like, and don’t forget: the Doctor’s favorites were the orange ones! http://minimalistbaker.com/roasted-beet-hummus/ Celery was worn by the?Doctor?on his lapel and is used to detect certain gases that may kill him; in the presence of these gases, it turned purple. Dip celery stick dippers into this beetroot puree for the same colors at your party. http://www.lavenderandlovage.com/2014/11/edible-gifts-for-giving-spiced-brandy-soused-clementines.html The 10th and 12th?Doctors?both highlight the importance of satsumas or tangerines on Christmas Day during a Christmas special. While the 10th Doctor employed the satsuma as a weapon of sorts, using it to defeat the Sycorax, the 12th Doctor encountered satsumas – and a version of Father Christmas – in a dream. http://www.fiction-food.com/2013/08/rose-cupcakes-w-edible-ball-bearings.html The Doctor was enamored by these cakes topped with “edible ball bearings” when he visited 1948 London, and Rose brought him one at the end of their adventure for him to enjoy. He may have lost Rose, but he’s still got these cupcakes – flavored with rosewater syrup. https://kitchenoverlord.com/2015/12/10/create-your-own-red-eye-free-ood-cookie-servants/ Odd? Maybe. Delicious? Definitely! The Ood in the series were empaths with a hive mind who were enslaved by the human race; at one point, it was said that every human had an Ood. Much better for everyone to have an Ood cookie, don’t you agree? http://www.sweetdreamscakeapp.com/2013/11/25/doctor-who-50th-anniversary-viewing-party/ The Daleks have long been one of the Doctor’s most fearsome foes. In this incarnation, they’re slightly less frightening – it’s hard to “Exterminate” when you’re made of crudités. How crushed were you when the BBC announced that we wouldn’t be getting a new season of Doctor Who until 2017? The camp British television show has definitely caught on both in the UK and in the US since its 2005 revival, and while the months to wait until the Christmas special and the introduction of new companion Bill will definitely be long, you can take advantage of this time to throw a Whovian bash and get familiar with some of the Doctors in the iconic role before Peter Capaldi’s current 12th incarnation. All parties need a good snack (and a banana), so here are just a few of our favorites to serve.